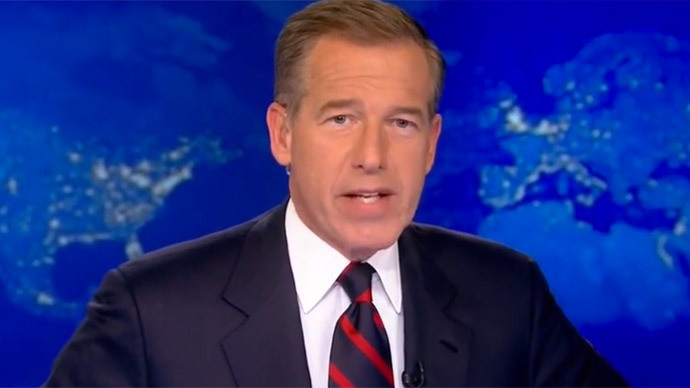 In a recent broadcast paying tribute to an Iraq War veteran, NBC’s Brian Williams said that he was onboard a helicopter brought down by enemy fire in Iraq in 2003. However, he has now retracted the story after soldiers present exposed his claim as a lie. Williams addressed his “bungled” story on his show Wednesday night. He also recanted the story in an interview with the military newspaper Stars and Stripes, also published Wednesday. The controversy arose after NBC News broadcast a public tribute to Command Sgt. Maj. Tim Terpak, an Iraq veteran who Williams said had been in charge of the journalists’ safety at the time of the incident. The tribute was shot at a New York Rangers hockey game, which Williams attended with Terpak. At the game, Williams recounted his helicopter story. The trouble was that Williams’ account wasn’t true. Sgt. 1st Class Joseph Miller was a flight engineer on the aircraft that carried journalists. “No, we never came under direct enemy fire to the aircraft,” Miller told Stars and Stripes. The claim by Williams rankled Miller, as well as other soldiers aboard the Chinooks that did come under attack in 2003. Reynolds said Williams and the NBC cameramen arrived in a helicopter 30 to 60 minutes after his damaged Chinook made a rolling landing at an Iraqi airfield and skidded off the runway into the desert. He said he brushed them off because his crew was trying to assess damage to the aircraft and he was worried his wife might see the news report. He said he wanted to tell her everything was all right. Stars and Stripes reported that Tim Terpark, with whom Williams struck up a friendship, was one of the soldiers of an Army armored unit that provided security around the aircraft. Stars And Stripes also noted that Williams’ story has “been repeated by the network for years.” You can watch him telling it on “The Late Show With David Letterman” in 2013 here. In his broadcast Wednesday, Williams, who has won a Polk and a Peabody for his news reporting, admitted his mistake.